A snow storm has finally arrived in Churchill, Manitoba which is what this polar bear has been waiting months for so that he can head to the shores of the Hudson Bay for a good meal of ringed seals. The snow on the tundra across the Churchill Wildlife Management Area is still thinly dispersed, but a few good snow storms will bring in cold weather and start to freeze everything in the region. The Polar Bear is the largest land predator throughout the world and in past years, there has been little for this marine mammal to fear. As global warming takes a serious effect on the Churchill Wildlife Management Area, the first sign of a winter snow storm is always a welcoming sight. 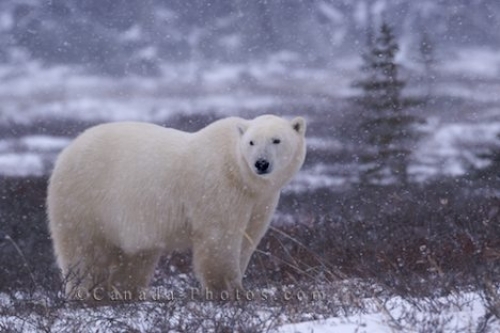 Picture of a Polar Bear in the midst of a winter snow storm in the Churchill Wildlife Management Area in Manitoba, Canada.